Ahoy friends, family, fans and friendly sentient robots! A happy Cyber Monday to you all! Just in case you have been Rip Van Winkling your days away in a cave without wifi, Cyber Monday is the day Americans have historically reserved for online shopping, a tradition which I believe dates back to the pilgrims. In commemoration of this beloved American tradition, I invite friends from every nation to use the code CYBERMON13 for a whopping 15% off all orders now through Wednesday. I will caution you not to get lost in the maze-like system of elevators-to-nowhere and stairwells leading to floor after floor of locked doors. I have a conspiracy theory that the Merchandize Mart was designed by Steven King to test out ideas for a horror novel. Even if you are not a fan of fear and inconvenience, you should still come to the show. Email me info@peggyskemp.com and I will send you free tickets! Here’s a sneak peak at a few new pieces! I’ll have simple silver earrings under $30, a new selection of work inspired by forest walks, and a few very intricate anatomical pieces like this silver lacy lung necklace with alveoli detail, finished just in time for One of a Kind! 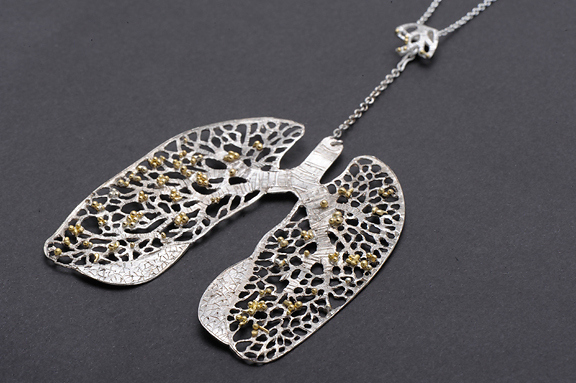 Silver lung necklace with 22k yellow gold granulation alveoli and hand-engraved detail. 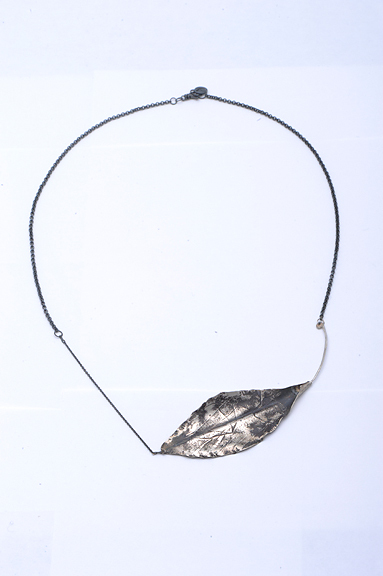 Silver Leaf necklace with oxidized chain by Peggy Skemp 2013. This year I will also have a corner of my booth devoted to the new Stella Home products. You can come see in person the new tall folding tables, perfect for standing at the computer, or for your mobile office, and take home one of our hand-made vintage glass and wood jewelry boxes. Just in case you miss the opportunity to share a cocktail with me at One of a Kind this weekend, you can still find great holiday deals on my Etsy page! Check the sale section for especially generous gift ideas!